1. Make sure your running shoes are a match for your gait and that they fit your feet correctly. Blistering in the arch area of the foot is often a sign that a runner overpronates and requires a more supportive shoe. Incorrect width and/or length of the shoes can also contribute to blistering on the toes, on the heels, or also on the outsides of the feet. It is advisable to purchase shoes from a running specialist who will ensure you have the best possible fit for your feet and for your gait. 2. 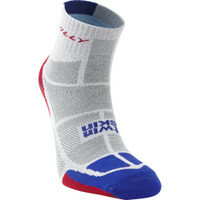 Choose breathable running socks which wick away perspiration from your skin. Cotton fabrics hold moisture and can make blistering more likely. 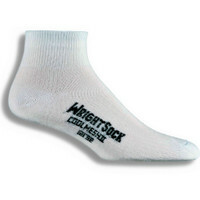 Socks will vary in ankle length, in thickness and in the number of layers, usually one or two. A sock with an ankle may provide a protective layer between the shoe and your skin. Some socks are double-layered, helping to reduce friction, one layer moving with the shoe, the other layer moving with your foot. 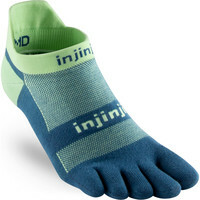 Yet other socks have individual toes, which can prevent the skin of one toe rubbing against the skin of another. 3. Wrap micropore surgical tape around your toes. It is extremely thin but can act as a protective layer, preventing skin from rubbing against skin. I have used this successfully. 4. Periodically check your shoes for any grit which may have got in. Pull the insoles out (unless they are stuck down), remove any fluff and bits that may have accumulated on them, tap the shoes on the ground and shake them out. It's surprising how the smallest bit of material can become a huge irritation to skin when running. 5. Use Bodyglide to provide a protective layer on a potential trouble spot. Some runners use Vaseline as an alternative. 6. Loop-lace your shoes to ensure a secure fit at the heels and to minimise any sliding. Make a small loop on each side of each shoe by threading each lace into the top lace-hole of the shoe, from the outside to the inside. Most running shoes have a top lace hole which remains unused, although some shoes do not. Then thread each lace down through the opposite loop. Pull the laces up and down until the loops sit flat against the uppers of the shoes. This draws in the heel area of the shoes more snugly around your ankles. It's important for the loops to sit flat against the shoes, for this technique to be effective. Even if we are as prepared as we can be, sometimes a hotspot or a blister can occur. We may be running further than we ever have, or we may be running on uneven terrain. If you feel a hotspot developing on your feet it's best to treat it quickly, before a blister actually develops. 1. 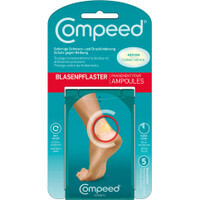 Use Compeed to act as a protective layer of skin. Compeed is available in different sizes, so you can find the right size for your hotspot. You can also apply Compeed to a blister which has already formed. If applied correctly you may well be able to continue your run. The plaster is designed to be left in situ until it naturally peels away. Full instructions for use are given in the packet. 2. To burst or not to burst? This is a question I again faced recently, having developed a blister under one foot. I decided to use Compeed, not to burst the blister, and to walk gingerly for a while! Since then I have researched both the Compeed website and the NHS website and the best advice would seem to be not to burst a blister but to cover it and allow it to heal by itself. The body will reabsorb the fluid, and a new layer of skin will form, while the outer layer of skin acts as a protective barrier. If the blister does burst, drain it, keep it clean so as to avoid infection, and cover it while it heals. 3. 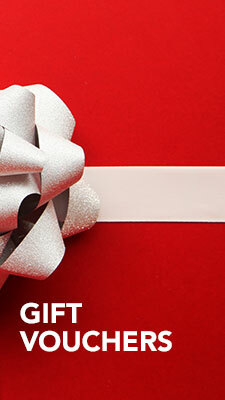 If your skin chafes in areas other than your feet, Bodyglide can be applied there. 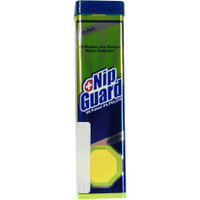 For men, Nipguards can be helpful. Nobody likes a blister! Good preparation can minimise the risk of blisters forming, but if blisters do appear, there are ways to treat them effectively and safely, so that you can continue running, or get back to running soon.